Parts of tri-state are facing serious cleanup after a deluge of rain on Friday. Michael George reports. Heavy rain and strong winds battered the tri-state area Friday, flooding parts of New York City and New Jersey within minutes, submerging cars and taking down highway retaining walls, suspending some transit service and delaying flights by nearly six hours. Flooding made for an unpleasant experience inside subway and rail stations, as water cascaded from ceiling and down stairs. PATH service was also suspended. Marc Santia reports. Penn Station shut down its main entrance at 32nd Street and Seventh Avenue for about an hour because of the heavy rain; the stairwell at 31st Street was also closed. Workers were scrambling to contain and clean up after leaks at World Trade Center's Oculus, while water cascading down inside Grand Central Terminal forced people to walk through the halls with their umbrellas open. Some subway stations were flooded and water was pouring down ceilings. PATH service from both Journal Square and Hoboken into 33rd Street in Manhattan was suspended after heavy rain poured down a manhole and onto the third rail at Christopher Street, knocking out power, law enforcement sources said. Crews were working to pump out water and get service back up and running. In the meantime, NJ Transit rail and buses are cross-honoring. Check for updates here. Water was pouring from the ceiling and the ground was flooded in Grand Central Terminal Friday, with one woman even holding her umbrella open inside to shield herself from the deluge. I guess the "flood warning" was for real this time. 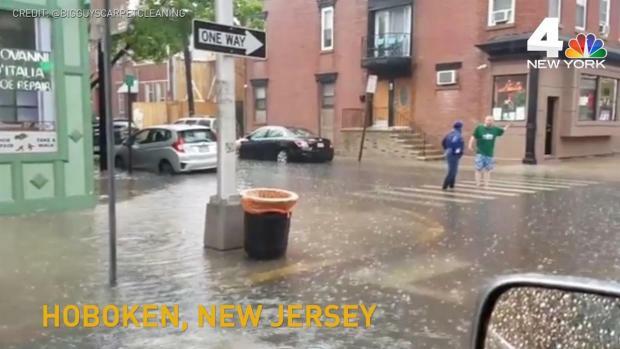 Highways and roads across other parts of northeastern New Jersey flooded quickly: water rose quickly on Route 440 and West Side Avenue, and cars were completely submerged in some parts. 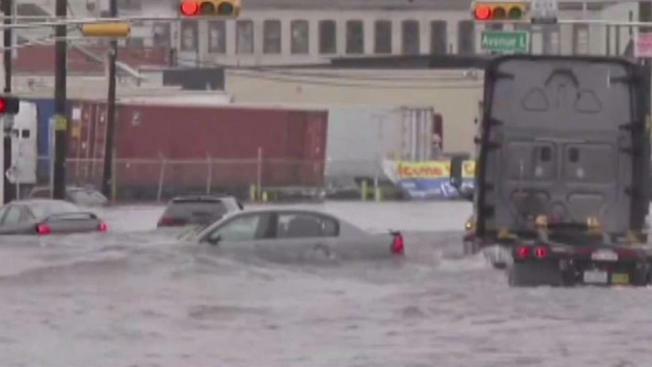 Roads flooded quickly in Jersey City, Hoboken, Newark, Lodi and other cities across northern New Jersey. Cars were submerged, and some drivers had to be rescued. Brian Thompson reports. In Hoboken, the police chief asked people not to drive unless it's an emergency due to massive flooding. Video posted to social media showed pedestrians wading in ankle-deep water in the middle of Hoboken intersections. 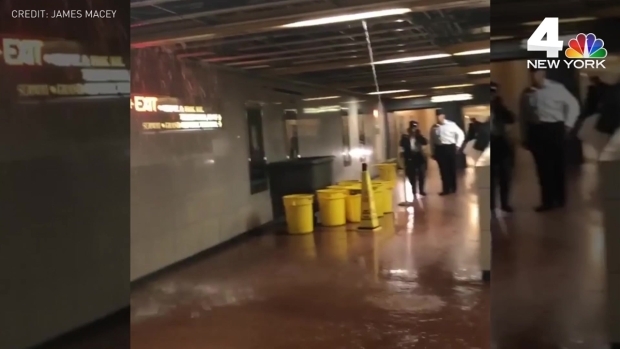 Footage shows one Hoboken street strreaming with water after flash flooding on Friday, while water was pouring down the walls at Borough Hall subway station during the deluge. Traffic crawled on New York City roadways, some of which temporarily closed because of the flooding. The West Side Highway was closed in midtown briefly because of the rising water. Streets in Gowanus, Brooklyn, were flooded, and a stone wall collapsed under the elevated Gowanus Expressway at 17th Street and 3rd Avenue. Fire officials on the scene said too much water caused the wall to slide. 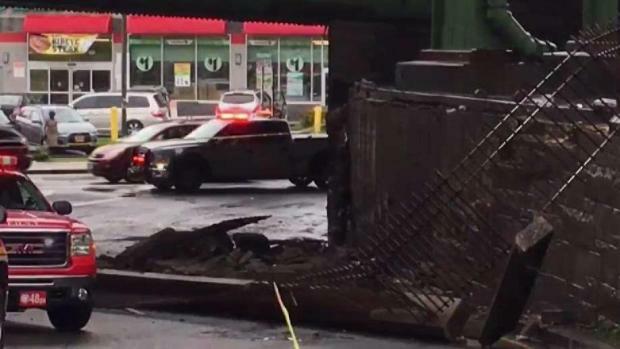 In Brooklyn, the weight of the water brought down a wall right underneath the Gowanus Expressway. John Chandler reports. 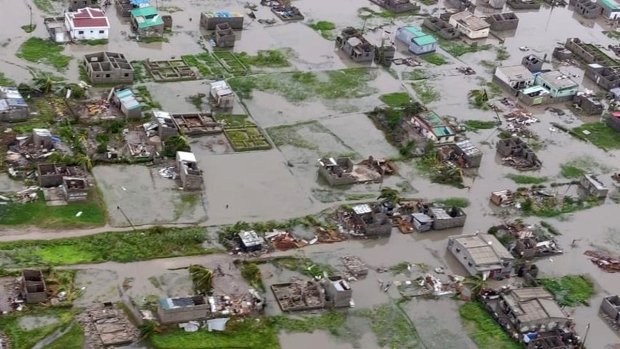 Local airports were crippled by the intense weather system. Delays at JFK Airport were pushing six hours by early evening, while Newark and LaGuardia were reporting delays exceeding three hours, respectively. Storm Team 4 said rain was likely to soak much of the region through the early afternoon. Another round of scattered showers may develop in the evening, and while drivers may deal with residual flooding, conditions should improve drastically on the roadways through the evening. Track the rain using StormTracker 4, the most accurate radar in the tri-state, and get the latest severe weather alerts for your area here. Three inches of rain had fallen on Central Park by late afternoon, according to Storm Team 4. Teterboro Airport saw 3.2 inches, and LaGuardia Airport in Queens saw 2.2 inches. The weekend won't be a washout. Saturday appears to be the warmest weekend day, with forecasters predicting a high of 66 degrees for the city. It's also the most likely for rain, with showers expected in the afternoon hours. Sunday's highs will be in the low 60s under partly cloudy skies. The cooler trend continues into next week, Storm Team 4 says, with the mercury expected to stay in the 50s Monday and Tuesday. The chance for additional showers ramp up by Thursday as temperatures stay below average for mid-May.